I first did this recipe with gluten free puffed corn cereal (think Rice Krispies, just not as crispy!) and while they tasted good, they weren’t as crispy as I liked and after some feedback from my Dad and Sister, I decided to try cornflakes and the rest as they say is history! 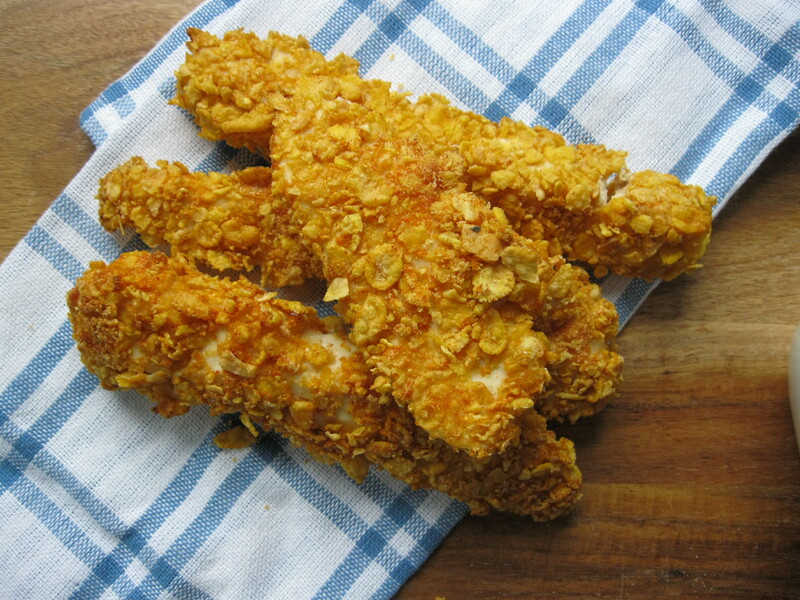 Just be sure that the cornflakes you buy have no sugar, unless you want sweet goujons! I’ve given the flavourings as optional, whichever flavourings you choose to add I would still keep in the onion salt as it does make all the difference in my opinion. Whenever I do have meat or poultry nowadays, which isn’t that often, I do pay a little extra for free range organic items, that is just my personal preference. Non-organic meat/poultry tend to be injected with growth hormones, antibiotics etc so there is a chance that the medicines could be in the meat you eat. I’ve not added any extra salt to these goujons as cornflakes normally have salt added and I’ve taken into account the onion salt too. Line a baking sheet with foil or baking parchment. Line up 3 bowls. In one put the flour, in another the beaten egg and water and in the third the cornflakes. Using your hand smash up the cornflakes but not too finely as you still want some texture and crunch. 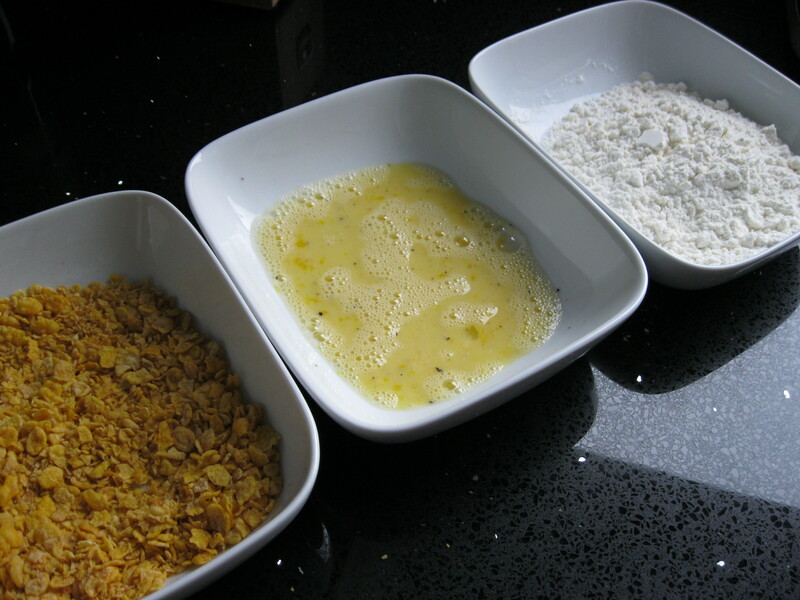 Once your cornflakes have been smashed up, mix in the onion salt and any other flavourings you are using. Take a strip of chicken and coat it in flour, shaking off any excess. Then dip it into the egg then roll in the cornflakes, ensuring it is fully covered. Lay the goujon on the baking sheet and repeat with the remaining chicken strips. 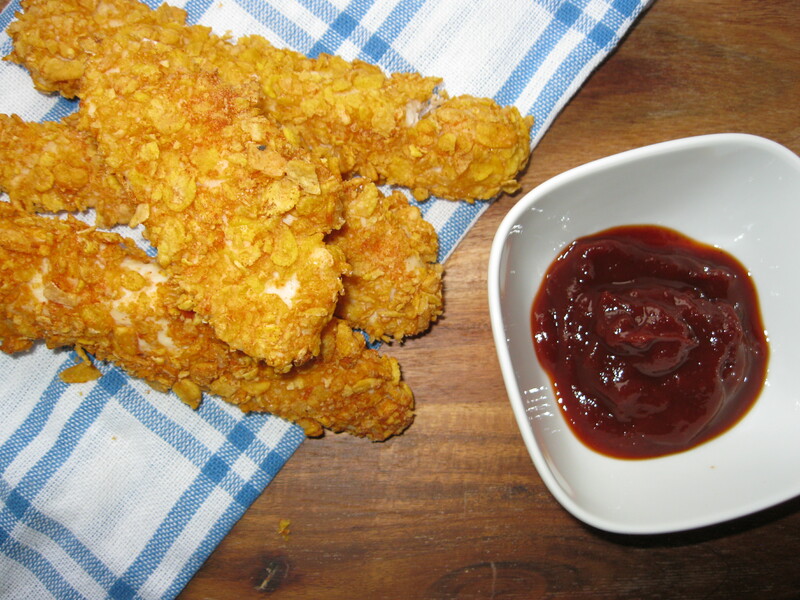 Place the coated chicken strips in the oven on the middle shelf and bake for 10 minutes then turn and bake for another 10-12 minutes until fully cooked. Serve immediately or allow to cool before storing in an airtight container in the refrigerator.